If you’re looking for something to take your Halloween celebration over the top this year, you can impress Trick-or-Treaters and party goers alike. 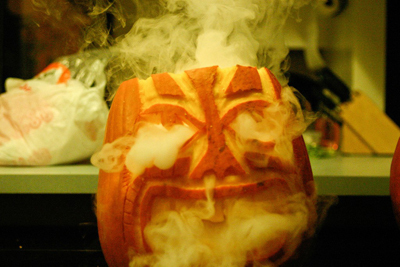 With a little water and dry ice, anyone can create a smoking pumpkin or a foggy backyard. Fog All Around – For an extra eerie effect, place large bowls of water at your front door and drop a small amount of dry ice and a few drops of liquid dish soap to make fog-filled bubbles that pour out onto your porch. 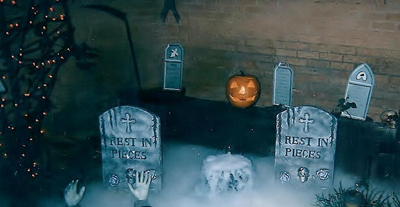 Smoky Jack ‘O Lanterns – Take your pumpkin to the next level with a similar dry ice fog effect. 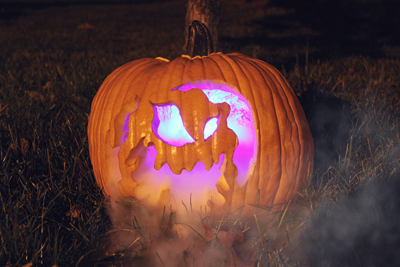 Place a small bowl with water and dry ice inside a pumpkin to create fog that spills out of the pumpkin’s carvings. Set the (Creepy) Mood – Forget the Monster Mash. Let dry ice provide the screeching soundtrack to your party instead. Just add small pieces of dry ice to a metal bowl. Make a Spooky Brew – Taking your Halloween celebration indoors this year? Convert your kitchen into a mad scientist lab by adding small amounts of dry ice to your a punch bowl and serving drinks out of beakers. One favorite recipe? Equal parts ginger ale and orange juice with scoops of orange sherbet. Just be sure to remove the dry ice from glasses before drinking. Experts say buy about 50% more than you’ll need on party day if you’re buying ahead of time. And experts suggest you do so, because many retailers are out of dry ice by the time you’re ready to party. Dry ice sublimates and you’ll need to store carefully and safely to be sure you have enough left for your planned foggy night. For more information visit the dry ice website.